What is Anti-Racist Bystander Intervention? - TN Anti Racist Network: Not In Our State! Stop the Hate! RSVP to our Facebook event! Questions? Feel free to email us! What is Anti-Racist Bystander Intervention? Anti-racist counter actions contribute to the marketplace of ideas and our shared public space, by countering hate speech with pro-equality ideas. It is based on the theory of “bystander intervention” against hate. Bystander anti-racism is conceptualized as action taken by “ordinary” people in response to incidents of interpersonal or systemic racism. 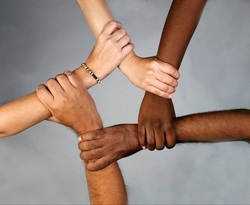 Bystander anti-racism is an action taken by a person or persons (not directly involved as a target or perpetrator) to speak out about or to seek to engage others in responding (either directly or indirectly, immediately or at a later time) against interpersonal or systemic racism. The most effective bystander action is that which communicates a message of disapproval or discomfort without damaging interpersonal relations. To that end, we hope to foster a culture of respect. The public intolerance of racist behavior can have a vital contextual effect on subsequent acts of racism, and also on attitudes. Public condemnation through bystander anti-racism can potentially combat “false consensus effects” that result from individuals overestimating general community support for their racist views. The established positive effect of bystander anti-racism on perpetrators is to constrain their racist behaviors, challenging their concensus perceptions, and constructing racist acts as a deviance. A banner made by children staying in a homeless shelter in Nashville, TN, sends the right message.